There is also a significant unmet need for surgery in LMICs and researchers believe that if operations were provided for all patients who need them the number of global post-operative deaths would increase to 6.1 million per year. Researchers at the University of Cape Town (UCT) and University of Birmingham in the United Kingdom, published their analysis on the numbers of people dying within 30 days of surgery in a research letter to The Lancet. They estimate that more people die each year within 30 days after surgery than from HIV, tuberculosis, and malaria combined (2.97 million). Researchers at the University of Birmingham’s NIHR Global Health Research Unit on Global Surgery analysed available information to estimate how many people around the world die after operations - based on surgical volume, case-mix and post-operative death rates adjusted for country income. Based on 4.2 million deaths, 7.7% of all deaths globally occur within 30 days of surgery. This figure is greater than that attributed to any other cause of death globally except ischaemic heart disease and stroke. 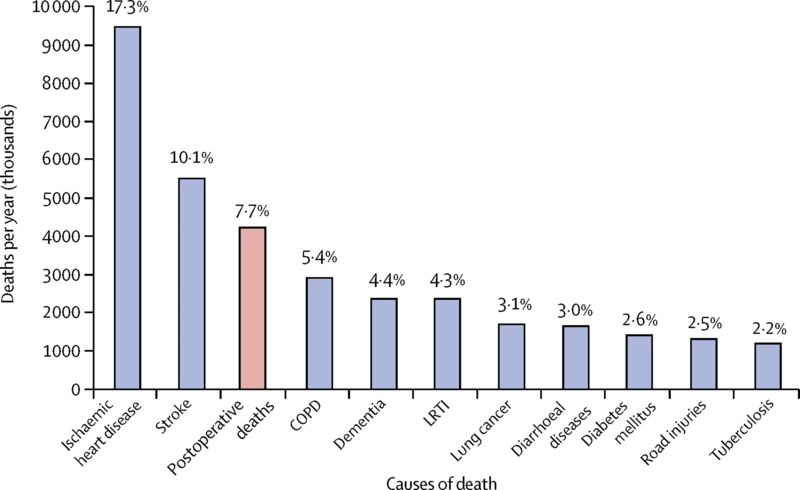 Read the Global burden of postoperative death study here. For the current 2019 fiscal year, the World Bank defines low-income economies as those with a GNI per capita, calculated using the World Bank Atlas method, of $995 or less in 2017; lower middle-income economies are those with a GNI per capita between $996 and $3,895; upper middle-income economies are those with a GNI per capita between $3,896 and $12,055; high-income economies are those with a GNI per capita of $12,056 or more.